Surgery for a retinal detachment includes a scleral buckle, pneumatic retinopexy and vitrectomy eye surgery. Retinal detachments, left untreated, will only get worse and cause permanent loss of vision, if not total blindness. 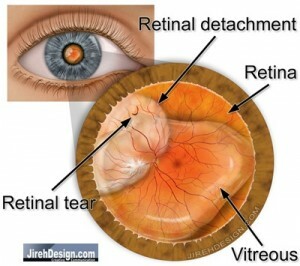 As you look at the illustration above, a retinal tear (also a retinal hole) causes a retinal detachment. Usually, this optically clear gel, the vitreous pulls on the retina and causes a retinal tear. A retinal hole, usually associated with a natural thinning of the retina, called lattice degeneration, can also lead to a retinal detachment. Regardless of the exact etiology, a retinal hole or tear causes a communication with the sub-retinal space. Fluid from the center of the eye, can now migrate underneath the retina causing the retinal detachment. Scleral Buckles – As the name implies, a band is wrapped around part or all of the eye, causing the eye wall (the sclera) to fold, or to “buckle.” The goal of the buckle is to reduce the internal diameter of the eye, and by doing so, relieves any traction, or pulling, on the retina by the vitreous. By bringing the walls of the eye closer, slack is put into the vitreous and there is less of tendency for the vitreous to cause additional tears. This may also allow the retina to relax and reposition itself properly. 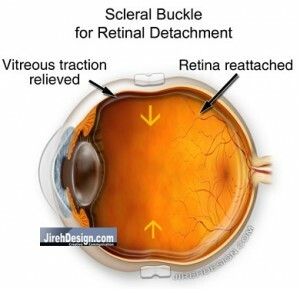 Scleral buckles for retinal detachment have been around for over 100 years. To me, this means that there is something inherently “right” about the surgery, that is, it is based upon some sound physical principles that allow it to work. Scleral buckling surgery is usually pretty successful in reattaching the retina. Side effects of scleral buckling surgery include, increased myopia and possible double vision. The myopia, or near-sightedness, results from an increase in the anterior/posterior (i.e. front to back) distance and the double vision may be caused by physical manipulation of the extraocular muscles; the muscles that move the eye. Vitrectomy surgery for retinal detachment has been around for about 35 years or so. This surgery is more invasive and requires surgical removal of the vitreous. 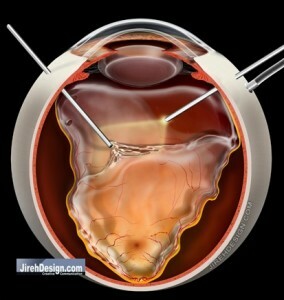 Usually during surgery, the retina is actually reattached and the vitreous gel, is replaced with gas. Depending upon the location of the retinal tears or retinal holes, the patient may be required to maintain certain head positions for a period of time. Vitrectomy eye surgery for retinal detachment may, or may not, be combined with a scleral buckle. Combination of scleral buckle surgery and vitrectomy is a common method to fix retinal detachments. While the surgery is a bit longer to perform, there are times when both should be performed. In this situation, the scleral buckle is placed on the outside of the eye in addition to vitrectomy surgery. Intraocular gas is commonly used to replace the fluid in the eye. It is used in vitrectomy surgery to reattach the retina and in pneumatic retinopexy. The gas functions as a cork. The surface tension of the gas creates a large “bubble” (think of soap bubbles). The bubble must be correctly positioned at the location of the retinal tear. This blocks transmission of fluid to the sub-retinal space. The gas absorbs by itself. Pneumatic retinopexy is a procedure that follows the same principles of vitrectomy, that is, it utilizes an intraocular gas bubble to help reattach the retina. Pneumatic retinopexy for the repair of retinal detachment can be performed in the office. It requires injection of intraocular gas, laser and/or freezing of the retinal tear, followed by proper head positioning. This can be a convenient alternative to a scleral buckle and/or vitrectomy in certain cases.